The Current USA Satellite Plus Pro is a very thin fixture with an impressive set of features. 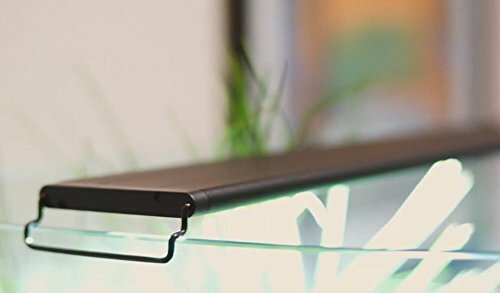 This LED Light is on the expensive side–you’re paying for a high level of light control and customization, and a built-in timer (among other features). This extra customization and timer automation won’t be right for everyone. You’ll need to decide for yourself if your tank needs these features (and if you need to shell out the extra cash!). Below, we take a dip into everything this Current USA Satellite Freshwater LED has to offer. Might as well start with the best features, right? How Does this Unit Compare? 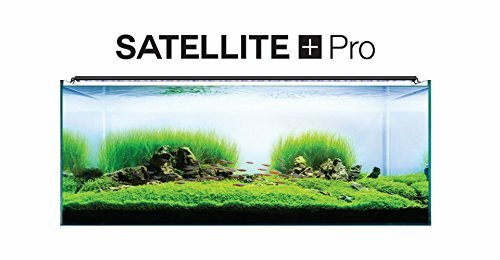 Is the Current USA Satellite Plus Pro Fixture Right for You? This Current USA LED light includes a timer that connects directly to the fixture. This timer also includes the receiver for the remote. You can choose the start time and the end time for the fixture’s daily light cycle (I.e. you can set the “on” time for 0900 and the “off” time for 1800). This particular Current USA Lighting fixture also includes a ramp up and ramp down window. Instead of your lights firing up to full blast, there is a 15 minute window in the beginning where the light starts at a low brightness and gradually gets brighter. This is repeated in reverse as the lights prepare to turn off, with a 15 minute window of gradual dimming. This lighting system gives you complete control over the colors it emits. Want more red and less blue? Simply use the remote to adjust the levels of each color until you find the values you like. Then, you can use one of two dedicated memory slots to save the color. Technically, the settings for the “daylight” and “moonlight” buttons, found right next to the memory slot buttons, can be customized. You can overwrite these stock settings however you’d like. The Current USA Satellite Freshwater LED gives you complete control over the brightness of the fixture, too. Is “full daylight” blasting your planted tank with too much PAR? No problem, just dim the light. Youtuber PeckTec unboxes his Satellite Plus Pro on camera. It’s worth a watch if you want to see how everything is packaged. He demos the majority of the features over the course of the video, but the unboxing takes place in the first few minutes. These are the sizes advertised by Current USA. It’s worth noting that these ranges show the tank sizes this fixture can accommodate. For the 24”-36” light, for example, the fixture is only 24 inches. That extra foot comes from the extendable brackets. This means your 36” tank would only have 24” of LED lighting. Can the 24” fit on your 36” tank? Physically, yes. Will it provide enough light? Maybe not. You might want to get the next size up. According to the review by YouTuber Aquarium Co-op, PAR for the “full daylight” mode on this fixture clocks in around 70-75. PAR was tested on a two foot tank with a 12 inch depth. In his review, he tests the PAR rating on more of the settings, and he gives his honest take on the fixture. 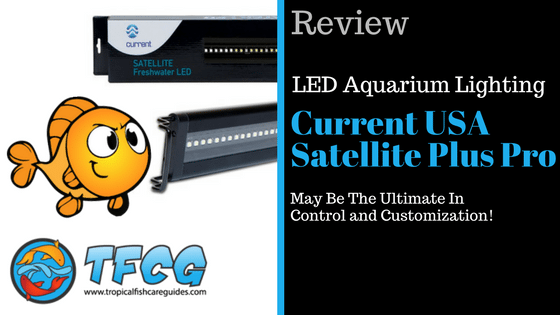 If you’re wondering about whether or not this Current USA Satellite freshwater LED is right for you, his review is worth a watch. The reviews for this Current USA LED light have been largely positive. In some cases, users complain of the timer working incorrectly, or not working at all. It’s possible that these complaints are valid and these users just received a junk timer. But this light isn’t a simple “plug and go” light–you’ll actually want to read the instructions before trying to operate this puppy. We just talked about this, but…we’re going to bring it up one more time: reference the manual as you set up this light. The setup process will go more smoothly, you’ll be happier, and your light will work correctly the first time. Isn’t that what we all want? The remote tends to work pretty well. If your remote is giving you trouble, make sure it has a clear path to the IR sensor in the timer. Also, make sure you remove the plastic insert that blocks the battery prior to customer use. This unit is more expensive than many other units on the market. If you’re looking for a simple fixture with high output, the Current USA Satellite Plus Pro is not that unit. There are cheaper options that can actually put out more light than this unit, for less money. This unit really shines (wink) in its automation and customization. That’s what you’re paying for with this unit–the built-in timer, the ramp up feature, the memory slots, and the color and brightness customization. For the record, this fixture also includes six weather effects (cloudy, stormy, etc). There are freshwater LED fixtures that offer automation. And plenty of aquarists have purchased generic timers to run their lights through. There are LED fixtures that offer color customization and brightness control. And some aquarists have gotten crafty with their hoods, to increase and decrease the amount of light entering their tank. Very few LED options exist that offer both 24-hour automation and brightness control in the same package. The ability to customize the “daytime” and “nighttime” modes for the built-in timer is huge, especially when you need to be careful about how much light is getting into your tank. This fixture isn’t right for everybody. If you’re looking for a simple planted tank lighting system solution, there are easier options out there. If you’re looking for a light with high output, but you don’t need the bells and whistles, there are cheaper options out there. But if you like the idea of this high level of customization and the built-in automation, then the Current USA Satellite Plus Pro is a great option to consider. As always, consider the needs of your tank. Don’t buy this light just because it has a “stormy” setting–think about what you’re trying to achieve with your planted tank, and what you need out of your light to do it.